by Chris Woodford. Last updated: March 4, 2018. Feeling too hot? You'll be wanting to cool down, then. Feeling too cold? You'll need to warm up. Our bodies are amazing, self-regulating mechanisms that can constantly adjust to keep their temperature within a whisker of 37°C (98.6°F). But the rest of the world isn't quite so helpful. If we want our homes to keep their temperature more or less constant, we have to keep switching our heaters on and off—or, alternatively, rely on clever gadgets called thermostats to do the job for us. What are they and how do they work? Let's take a look inside! 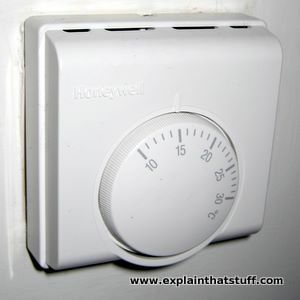 Photo: A simple, mechanical Honeywell thermostat mounted on a wall. This one is marked in degrees Celsius. Once you've set the temperature, the thermostat is supposed to switch the heating on and off, as necessary, to keep the room more or less that warm. In practice, a thermostat like this doesn't switch on and off at a single temperature but cycles between a small range of temperatures either side of the value you set. You might have a temperature control on a wall in your home to control the heating system but, although it's probably marked in degrees, it's not a thermometer. It's called a thermostat, a modern word based on two ancient Greek ones: thermo (meaning heat) and statos (which means standing and is related to words like stasis, status quo, and static—meaning to stay the same). We can tell just from its name that a thermostat is something that "keeps heat the same": when our home is too cold, the thermostat switches on the heating so things quickly warm up; once the temperature reaches the level we've set, the thermostat switches the heating off so we don't boil. Let's just be clear about the difference: a thermometer is something that measures the temperature; a thermostat is something that tries to maintain the temperature (keep it roughly the same). 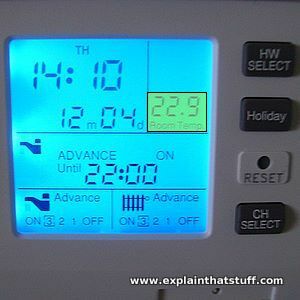 Photo: An electronic room thermostat showing a digital temperature reading (22.9°C). This one works slightly differently to the mechanical one in the top photo. The display is part of a central heating programmer with a built-in thermometer that constantly measures how hot the room is, then switches the heating on and off to keep it within 1°C of the temperature you've set. So how does a thermostat work? Most things get bigger when they heat up and smaller when they cool down (water is a notable exception: it expands when it heats up and when it freezes too). 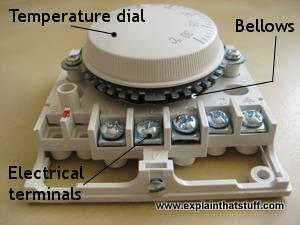 Mechanical thermostats use this idea (which is called thermal expansion) to switch an electric circuit on and and off. The two most common types use bimetallic strips and gas-filled bellows. A traditional thermostat has two pieces of different metals bolted together to form what's called a bimetallic strip (or bimetal strip). The strip works as a bridge in an electrical circuit connected to your heating system. Normally the "bridge is down", the strip carries electricity through the circuit, and the heating is on. When the strip gets hot, one of the metals expands more than the other so the whole strip bends very slightly. Eventually, it bends so much that it breaks open the circuit. The "bridge is up", the electricity instantly switches off, the heating cuts out, and the room starts to cool. But then what happens? As the room cools, the strip cools too and bends back to its original shape. Sooner or later, it snaps back into the circuit and makes the electricity flow again, so the heating switches back on. By adjusting the temperature dial, you change the temperature at which the circuit switches on and off. Because it takes some time for the metal strip to expand and contract, the heating isn't constantly switching on and off every few seconds, which would be pointless (and quite irritating); depending on how well-insulated your home is, and how cold it is outside, it might take an hour or more for the thermostat to switch back on once it's switched off. Electrical engineer Dr Ray Franco has compiled some excellent photos of bimetal strip thermostats that show exactly how they work. An outer dial enables you to set the temperature at which the thermostat switches on and off. The dial is connected through a circuit to the temperature sensor (a bimetal strip, shown here colored red and blue), which switches an electrical circuit on and off by bending more or less. The bimetal ("two metal") strip is made of two separate metal strips fastened together: a piece of brass (blue) bolted to a piece of iron (red). Iron expands less than brass as it gets hotter, so the bimetal strip curves inward as the temperature rises. The bimetal strip forms part of an electrical circuit (gray path). When the strip is cool, it's straight, so it acts as a bridge through which electricity can flow. The circuit is on and so is the heating. When the strip is hotter, it bends and breaks the circuit, so no electricity can flow. Now the circuit is off. The trouble with bimetallic strips is that they take a long time to heat up or cool down, so they don't react quickly to temperature changes. 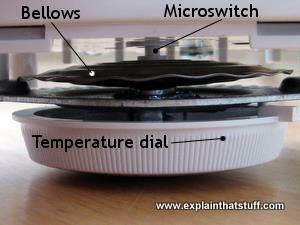 An alternative design of thermostat senses temperature changes more quickly using a pair of metal discs with a gas-filled bellows in between. The discs have a large surface area so they react quickly to heat and they're corrugated (they have ridges in them) to make them springy and flexible. When the room warms up, the gas in the bellows expands and forces the discs apart. The inner disc pushes against a microswitch in the middle of the thermostat turning the electric circuit (and the heating) off. As the room cools, the gas in the bellows contracts and the metal discs are forced back together. The inner disc moves away from the microswitch, switching on the electric circuit and turning the heating on again. You can also find corrugated bellows thermostats in other applications (for example, older cars), and, instead of gas, they're sometimes filled with a volatile (low-boiling) liquid such as a diluted alcohol; the exact chemical inside depends on the range of temperatures over which they need to operate. Photo: A Honeywell thermostat (the one in our top photo, and shown here with with the case removed, from two different angles) regulates temperature with a pair of metal discs, separated by a gas-filled bellows, that push against a microswitch. Turning the temperature dial moves the discs nearer to or further away from the microswitch in the center. That means the gas bellows has to expand more or less to turn the electricity on or off—effectively raising the temperature at which the switch triggers (and the room temperature). Summing up what we've discovered already, you can see that all mechanical thermostats (all non-electronic ones) use substances that change size or shape with increasing temperature. So bitmetallic thermostats rely on the expansion of metals as they get hotter, while gas bellows work using the expansion of gases. Some thermostats go further and use the change in state of a substance from liquid to gas. Wax thermostats are probably the most common example—and you'll find them in home radiator valves, car engines and mixer showers. They use a little plug of wax inside a sealed chamber. As the temperature changes, the wax melts (changes state from solid to liquid), expands greatly, and pushes a rod out of the chamber that switches something on or off (operating the engine cooling system in a car or regulating the mixture of hot and cold water in a shower to ensure your body doesn't get boiled like a lobster). Wax thermostats tend to be more reliable and longer lasting in the extreme conditions inside a vehicle engine. Animation: How a wax thermostat works. The wax (blue) is inside a sealed chamber (gray) that contains a metal needle (silver). As the temperature increases, the wax melts, expands, and pushes the needle out of the chamber (yellow arrows). The rising needle switches on or off whatever device the thermostat is controlling. A spring (not shown here) pulls the whole mechanism back again as the temperature falls. 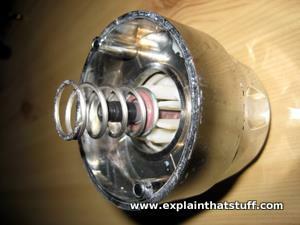 Photo: Here's the inside of a mixer shower control, showing what a wax thermostat actually looks like. The little black cylinder in the middle is the wax thermostat, which moves in and out to regulate the hot and cold water, keeping the mixed water (coming out of the shower head) at a more or less constant temperature. This photo shows the spring that pulls the thermostat back as the temperature falls and the wax thermostat contracts again. Photo: This thermostatic valve regulates the flow of hot water through a radiator to stop the room from overheating. If the room gets too hot, it triggers a wax thermostat that actuates a valve, shutting off the flow of water through the radiator until the temperature falls back down again. 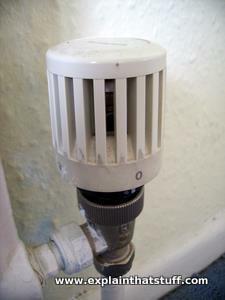 Temperature valves fitted to central heating radiators typically use wax thermostats. When the radiators heat up to the level you've set, the wax valves expand and reduce the flow of water through the radiator until the temperature falls back down again. Coupled with room thermostats, valves like these can stop your home from overheating—and that's a good way both to save energy and money and do your bit in the fight against global warming. Photo: A typical smartphone app linked to a home thermostat. This one's supplied by Hive (British Gas) in the UK; other rival makes come from companies such as Nest and Honeywell. Most of us spend only a half to a third of our time at home: the rest of the day, we're either at work or traveling there. Typically, we'll have a programmer or thermotstat at home that switches the heating on or off either according to the time of day or the inside temperature. But that's a crude system at best. By default, to avoid a cold home, a lot of us just turn the heating up high, wasting huge amounts of energy and money. That's the problem the latest generation of smart thermostats are designed to solve. They learn how you manually alter the temperature at different times of day, or differently during the week and at the weekend, comparing that with objective temperature and humidity measurements to establish a reliable program they can follow automatically in future. Typically, they also allow you to program them remotely using a simple smartphone app so you can turn the heating up on the train on your way home, for example. Black & Decker: The Complete Guide to Wiring, 6th Edition: Editors of Cool Springs Press, Cool Springs Press, 2014. Explains how to repair and replace various types of home thermostats. Refrigeration and Air Conditioning Technology by John Tomczyk, Eugene Silberstein, Bill Whitman, and Bill Johnson. Cengage, 2017. Includes some discussion of thermostats used in cooling systems in "Unit 14: Automatic Control Components and Applications." How to Make Nest's Thermostat Your Smart-Home Hub by Michael McCole. Wired, February 10, 2016. A quick introduction to Internet-linked thermostats. Home Thermostats, Wallflowers No More by Farhad Manjoo. The New York Times. December 7, 2011. 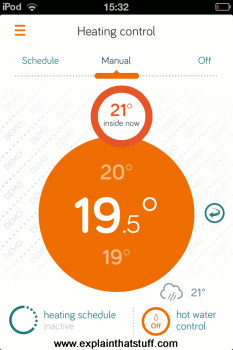 Looks at the latest generation of web-linked and programmable thermostats. A Thermostat That's Clever, Not Clunky by David Pogue. The New York Times. November 30, 2011. A review of Nest's Learning Thermostat. How a bimetal strip works by fizik.si. A neat demonstration of how a bimetallic strip bends when you heat it and straightens when you cool it. Bi-metallic electric switch by ki65ki1. In this simple circuit, a bimetallic contact switches on and off as it's cooled by a fan and heated by a candle. How a wax thermostat works by TechTrixInfo.com. A clear and simple animated explanation. How an espresso machine thermostat works by Seattle Coffee Gear. A couple of coffee geeks take apart an espresso machine and study the bimetal thermostat inside. How to install a programmable thermostat by Home Depot. Explains how to choose and install a programmable electronic central heating thermostat.